Previous version Temple Run 2 1.39.3 apk for Android will help you to downgrade or install older app easily. This is one of the best Action apps. For those of you who want to have high scores in this game, there are some tips that you can use. You can raise the multiplayer by completing the mission. The greater the value of the multiplayer, then your score can be increased many times. You also have to run as far as possible to get the farthest distance, the farther you run the score you get will add up quickly. Do not forget to use the special power correctly. You can also use other characters because each character has its own special power. Do not forget to improve the abilities of each character that you have. 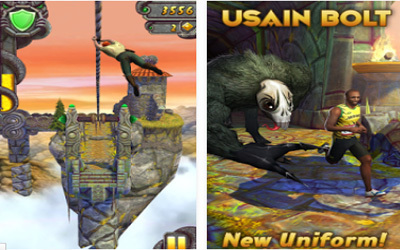 Unlike the Temple Run: Brave, the game was released for free. Even though to buy the diamonds or coins still you must use in-app purchase. The number of coins you get for running can be used to buy characters and upgrade their power-ups. Awesome updated version is very adventurous with new obstacles.